Wars as always, have their atrocities. Both sides unfortunately. Invariably, it is always the civilian sector that bears the most in losses – properties, dignity and life. My grandfather Pedro Viado Balinado was a schoolteacher in Libona but as war broke out, he became the municipal treasurer at Alubijid, Misamis Oriental. He could not be less than patriotic than the man in military uniform. He even named his children Mindanao (became Adolfo upon the insistence of a Roman Catholic priest saying Mindanao was a pagan name), Luzonia, Visayo, Prosperidad and Lualhati. Now, how can you get less patriotic than that? He was told thru the grapevine to abandon his post and yield the municipal treasury to the guerrillas. Being the family man that he was, it was the only job he could get to support his young family. He stayed put. 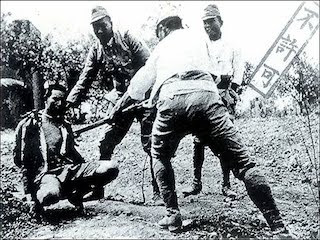 He was suspected of being a Japanese sympathizer just as President Jose P. Laurel was during the Japanese occupation and for that matter all who served in the Japanese civilian government during the war. One day, near the “Limena Bridge” close to Tanabog, Alubijid and unbeknownst to him, he was shot at close range at the back of his head and he fell from his horse. The deed was committed with all forms of treachery attendant. The perpetrators were a small band of guerrillas. He left behind a young wife and 5 children ages 15, 12, 8, 6 and 3. His decomposed body was recovered weeks later in a haphazardly dug grave. Realizing a few pesos from the sale of their farm carabao, this 15-year old boy took the slow boat to Manila together with a cousin, Jose FO Castro, also a wide-eyed 15 year old lad. He vowed to become a lawyer and seek justice for his father’s death. There, they worked as janitors and messengers and at the Libingan ng mga Bayani in Taguig transferring corpses and aligning the crosses. At night, they would attend their classes. This boy was sent to school by then Congressman Titang Fortich while serving as his messenger at the House of Representatives. The other worked on his own. Not long after, that 15-year old became a lawyer and his cousin became an accountant (he later became president of The Manila Bank – a Kagay-anon at that). This young lawyer’s first case was the murder of his father. The Manila Chronicle in its front page feature called it the Case of the Year. The gunman, an erratic guerilla admitted the crime all to himself saving his superior officers who were impleaded in the case by saying he acted alone and without any orders from anybody. He died in prison. But that young lawyer was Adolfo “Minding” “Mindanao” Balinado, the City of Golden Friendship guy who loved his city and its people. These stories have been passed on from generation to generation and it is always a welcome treat to know from where you come from. Well, war crimes as they are today are never countenanced much less seen with favour by the civil eye. The world knows that men always have rights. One of those rights is the right to know what your fault is and that you be given your chance to say your piece before a bullet hits you. Nothing less. A little dash of history to add to this good thread. I have to add another sibling I missed….his children were named Mindanao, Luzonia, Visayo, Prosperidad, Lualhati and Filipinas, whom I missed. Lualhati died at birth. Sir Bob, i can name a few more “victims”… The Mabulay and Roa Families too suffered in those crazy times, and i hope in due time they too will be remembered. Father Haggerty, had he not been a priest would have been killed too. The Fog of War During that time was so thick that one could not distinguish friend from foe and many many terrible things happened. The extra judicial killings that happened during the war was later on buried but not really forgotten, and it was the least talked about incidents of that generation. Mao kini ang gika gubtan sa Jaldon and Limena Guerrilla Factions before Wendell Fertig stepped in and had Fidencio Laplap took command. There you go Kerwin. You obviously know as much as anybody living today in CDO and MisOr does regarding these atrocities during that time. I am sure there are many others who suffered the same fate but these have been rendered hazy by the simplicity of folk life in the barrios then where farmers and lowly peasants did not have a say in anything during those days. Perhaps out of fear or ignorance, they just looked up to the heavens and sighed in total helplessness. But things like this story do not die. They haunt you like chained ghosts of the past. What opened the eyes of the world to atrociities like this is one simple snapshot that changed everything, but this was already in the late ’60s. The picture of South Vietnamese General Nguyen Ngoc Loan, chief of the national police,who shot a suspected Vietcong sympathizer Nguyen Van Lem pointblank in the head publicly during the Tet Offensive in February 1968. Well, wars always give us lessons, but unfortunately, man is a slow learner. One good thing that incident brought forth in our family was – that boy became a lawyer. If it were not for that incident, he would probably have remained and died a farmer.